Bed and breakfast in Kathmandu and Pokhara. Tea houses lodges and meals while in trekking. 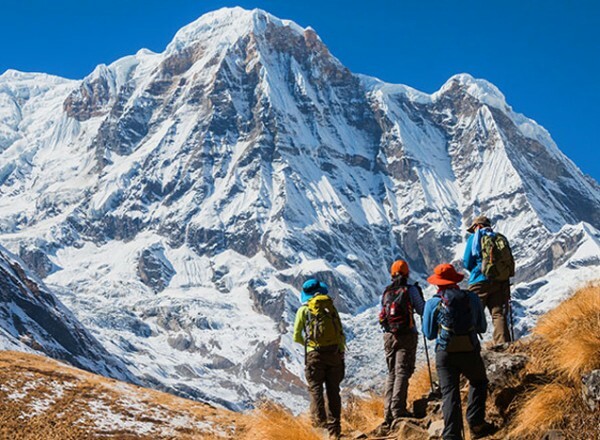 Annapurna Base Camp Trekking – This trek is popular as it offers a great variety of beautiful landscapes, nature and culture of the central mountains of Nepal.This trek is popular as it offers a great variety of beautiful landscapes, nature and culture of the central mountains of Nepal. From the plains of the Pokhara Valley lush with rice cultivation to the base camp of the mighty Annapurna Himal through the colorful villages, green forests, bamboo jungles, rivers and cascades rich with birds and animal life.The trail brings us to the base of the South face of Mt.Annapurna South (7219m) through the base camp of Mt. Machhapuchare (6993m). As we have minimized the walking hours in the base camp areas it allows ample time to savour the wholesome view of the mighty Annapurna Himal in a leisurely style. 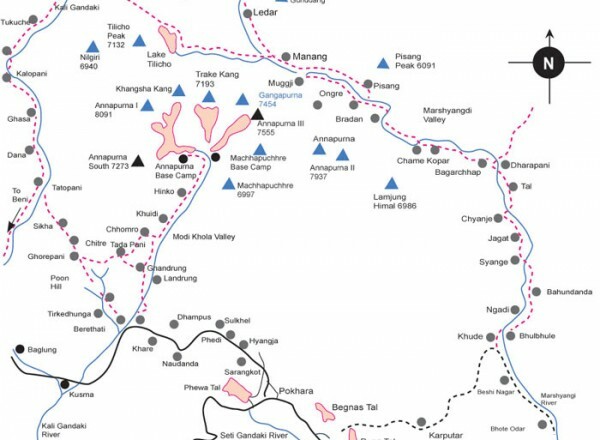 This region falls within the Annapurna Conservation Area, a project for environmental and cultural protection, accommodating both native and foreign visitor needs. 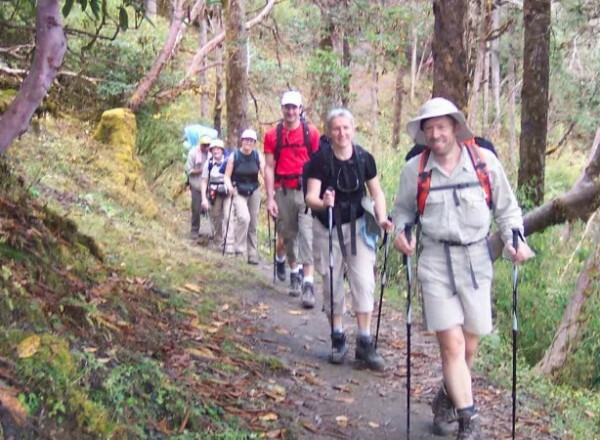 Actually, this trek is especially meant for those who wish to see and enjoy the special charm of high Himalayas and Glaciers so closely including Rhododendron forest with variety of birds and animals in a short period of time while in Nepal. Representative of Yala Adventure will meet you at airport and transfer to your hotel. The rest of the day at leisure to adjust to the culture shock of medieval Kathmandu. Overnight at Hotel. 3 hours half- day sightseeing to kathmandu Durbar Square , Monkey Temple & PashupatiNath Temple. All are world heritage sites listed by UNESCO. Rests of the day finalize trekking permits (TIMS),national park permit and final packing for the trekking. Today we drive to pokhara by tourist bus/car through the attractive scence of Nepalese contryside. These country sides offer the various vegetations, green forest,river,narrow,congested, rund about road and very beautiful green hills. After reaching pokhara (840m) the representative of Yala Adventure relocate you to the hotel. After breakfast we drive 41km/25 miles to go Nayapul for the start of our ABC trek. A steep trail from Nayapul directs us down to a bridge over a small stream to get to birethanti a large and prosperous villege. From Birethanti we take the lift branch of the trail on the west side of the bridge at the ACAP checkpost where we need to show ACAP permit and TIMS card. Following the trail through main streets of birethanti winding through bamboo forests and past a large waterfall and swimming whole we reach sudami beyond a pasture used by caravans.We climb steadily up the side of the valley rich hile and about 15 minutes above hille is the Tikhedhunga. We started early in the morning 5/6 hour trek crossing the Mahabir Khola on a suspension bridge,then drops and crosses the Bhurungdi Khola ona large bridge at 1520m. The trail climbs verysteeply ona stone staircase that is said to have more than 3300 steps which continue to the large Magar village of Ulleri (2080) and climbing gently through the pastures and cultivated fields the trail make its way to deep forests to reach a hamlet of Birethanti. Crossing the magnificent oak and rhododendron forests the trail passes throgh two sparkling clears streams, small ridge and another stream before making final climb to another Magar village of Nangathanti (2460m). About an hour past this village we reach ghorepani where we can see eight diffrent species of Nepal's national flower rhododendron in the hillsides below ghorepani. 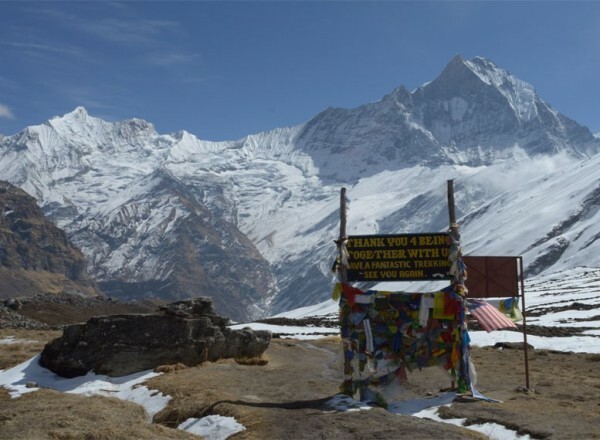 After one hours climb in the morning we reach Poonhill which is a viewpoint for the spectacular Himalayan panorama extending from Dhaulagiri to Annapurna to Machhapuchhre,that stretches from Dhaulagiri I (8167m) and Tukuche (6920m) to Annapurna South ,Annapurna I (8091m),Hiunchuli (6441m)and Tarke kang (7193m). Climbing just a little further beyond the viewpoint, the trail descends a bit and then goes through series of and downs through the forest of bamboo rhododendron and brich to reach hamlet of derauli which also has a viewpoint tower some 200m/660ft above the hamlet. Beyond Deurali crossing through the slippery stretches we reach a stream and taking the path above the strem. Crossing the bridge over the strem we climb steep stone steps with iron railings and reach the hamlets of Banthanti. The path drops steeply down now through the danse forests and crossing the bridge in the stream to reach Tadapani which offers an excellent ringside view of the entire region with a rang of mountains. This day has long decent of 780m and acent of 280m starting from the narrow trail through forests full of bromeliads to a pasture and now crossing through chiule we drop down on steep ,stepsthrough com and millet fields to siprung and to a old suspension bridge over the khumbu khola from where the trail startsclimbing to the spread out village of Ghurjung passing through the yard of several homes and lodge. Now crossing a wooden bridge we walk 30 minutes in out of side valley Dhiklyo Dada ,where the Ghandruk- Chomrong trail joins the route.Now climbing steeply gaining the view of Machhepuchhre we passed Through Taglung reah Chhromrong. Leaving Chhomrong,our trail decents on a stone staircase and crosses the chhomrong khola on a saying suspension bridge at 1860m and climbs out of the slide valley via thw tiny settlement of Tilche throungh forests of bamboo,rhododendron very quite.Climbing further on a rocnaky trail we reach Bhanuwa & Binuwa. Now climbing in a forest of bamboo & rhododendron we reach stone paved trail that passes Kuldi from enters the upper modi valley and decending a long ,steep. slippery stone staircase into a deep bamboo & rhododendron forest. We arrival at Bamboo (2310m). very beautiful lodge are there special warmly advive there.After one and half hours walking up Dobhan.we are all tributary streams on narrow bridge occasionally and keeping one eye of the troops of black faced langur monkeys and after treversing several avalanche chutes we reach the stone paved route of Dobhan. Our begining will same like previous days after Machhapuchhre base camp (3770m) by crossing Himalaya Hotel,Hinku Cave,where ModiKhola follows indiffrently. From the base camp you can see the tallest mountain watching from the top. From there we can view the surrounding snowcapped mountains including Machhapuchhre Annapurna etc. 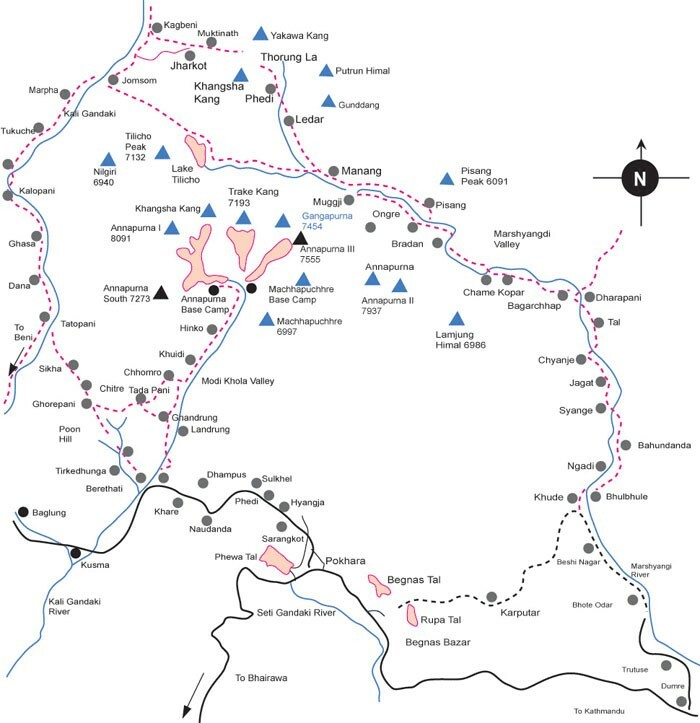 Today we are going to Machhapuchhre base camp to Annapurna base camp. Gradully, we trek ascending path to abc.This place is also called the Annapurna sanctuary because it's surrounded by the snow call mountain. 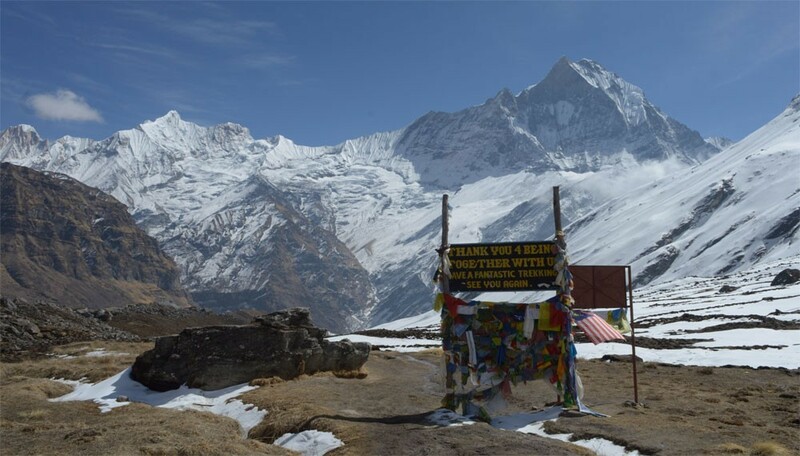 From there we anjoy the amazing view of the glaciers and mountains including Mt.Annapurna you can spend you whole day by watching the tantalizing mountains with the full of snows. Where we can enjoy the great mountain panorama views of Hiunchuli,Annapurna III Gangapurna and ever changing machhapuchhre. Trail hard if fresh snow /pleasent walk /the trail follows a stream and then climbs to a few huts, where shepherds graze their sheep during summer/the area is cold windy and often snowbound,walking passed the porter shelter and volleyball courts to a prayer lag draped viewpoint on the moriaine for a spectulars view over the glaciers and nearby memorial shorten for a climber Anatoil Bourkreev killed 1997 by avalanche, we reach ABC the sanctuary. In the sanctuary we can few birds, tahrs Himlayan weasels and Pika. Tharpuchuli (5663m) singuchuli,(6501m) and Hiunchuli are three trekking peaks accessiable from the sanctuary which requires skill,equipment advace planning to climb. This is a long ascend which we strat crossing dowm a stream and avalanche chute across a landslide to reach forest with small temple of baraha and one should not carry eggs or meat beyond this point climbing past a cascade over a rock platform we pass a decorated temple of shiva to rocky trail through forest heading back down the valley retracing our steps to Dobhan and further making a khulong steep climb back to the Chhromrong. To desends to ghandruk we return to trail junction at Taglung and swing right to climb to hotel to top of a landslide and again turn left after sometime at the trail junction now we head towards straight south which is a hertbreaking sight. Now desending steeply we reach kimromg village just above the khumbu khola. At kimrong we cross the bridge and stay on the left trail as it climbs out of the khumnu village and making a steep climb through forest and kumrong dada from kimrong dada it's easy decents to a bridge over the kyuri khola ten minutes from where the route is joined by a fork of the Ghorepani-Ghandruk trail from where we can turn east to reach a second largest Gurung settelment in Nepal Ghandruk village that has two museums out of which gurun Traditional Museum is the best. Our trek from Ghandruk to Landruk is the steepest part of our entire trek. The decent from Ghandruk to kyumi at the bank of Modi khola is almost 70 degree vertical. Then we climb up to Landruk which s almost equally steep but shorter.Through straight line distance between the two village would not be more then 500m,it takes us more than three hours to reach fom ghandruk to Landruk. We early morning view from Lamdruk is gorgeous. We see another show of the beautiful Annapurna shrouded by clouds towards the north. Towards the south, we see the beautiful hills and Modi river valley. Landruk is the preety for the first hour somewhat steep for the next hours. The mountain views from Pothana are indeed heavenly with machhapuchhre dominating the vista. We reminder for the trek is gradual downhill through the trails to Dhampus village. It takes us about two hours walk Dhampus. This is the exit point of the ACAP region and foreigners need to check out at Dhampus. Dhampus is connected to the highway by a graveled road to pokhara. So we take a short walk down hill to Phedi passing few teashop and houses from where we reach Pokhara after half and hour drive. This day we visit the pokhara valley.It is the beautiful city which is god gifted with the natural beauty.we visti Mahindra Cave,Davi's Fall, Fewa Lake world peace pagoda National Museums,Bindabasani Temple etc. You can enjoy of the full day whatever time you need.Overnight at hotel. Early in the morning we catch tourist bus and drive back to Kathmandu via Prithinarayan Highway. It takes 6/7 hrs to arrive at Kathmandu.You can also fly from Pokhara to Kathmandu by domastic airlines. You will be transfered to your hotel in Kathmandu. Today the journey comes to an end. We will transfer Kathmandu airport for your departure flight own destination. Items of a personal nature such as alcoholic drinks, cold drinks, laundry, phone calls and internet service. Bring at least one windproof layer of clothes, helping to reduce any chill factor influence.